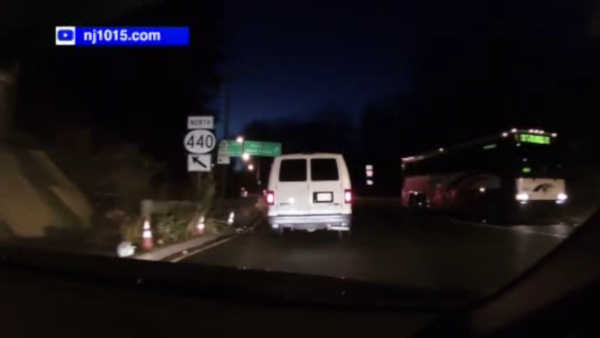 WOODBRIDGE, New Jersey (WABC) -- New Jersey Transit has removed a driver from service after another motorist posted DashCam video online of a bus driving the wrong way on a Garden State Parkway exit ramp. There was no accident or injuries reported in the incident, which occurred around 6 a.m. Thursday. The video showed the bus nearly colliding with traffic leaving the Parkway in Woodbridge. "The operator has been removed from service pending the outcome of our investigation. NJ TRANSIT's preliminary findings indicate this bus was heading to Smith Street to begin the #116 route, scheduled to operate from Perth Amboy to the Port Authority Bus Terminal in New York, and regrettably made the wrong turn in the New Brunswick Avenue/Industrial Avenue area. There were no customers on board the bus during this incident. NJ TRANSIT is committed to ensuring the safety of our bus operations, and strongly encourages our customers and the public to immediately report these incidents to NJ TRANSIT for immediate investigation."